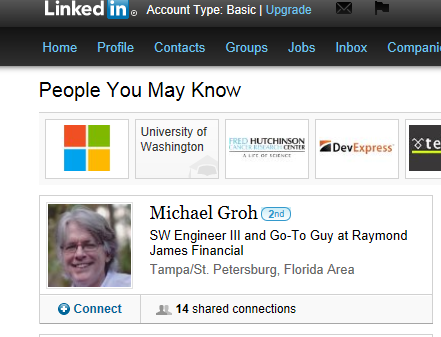 Many years ago during the 90’s I knew a very nice guy, a professional acquaintance named Michael Groh. He was the editor of an Microsoft Access magazine that competed with a Microsoft Access journal I edited but we got along just fine even if our publishers didn’t at the time. We both moved on from the Microsoft Access world into other pursuits and I can’t frankly tell you precisely when we lost touch. However, several years ago, in November of 2011 to be precise, I heard from a few mutual friends that Mike had died from pancreatic cancer. I was saddened by the news as were many who knew Mike professionally and personally. Fast forward two years and—I kid you not–I have started getting suggested LinkedIn invites to connect with Mike. Here’s one from today when I was perusing my profile. Needless to say, this is kind of strangely morbid. Some would say even creepy. When this started a few months ago, I was busy and thought it would stop but it has continued so that I now see Mike as a suggested connection quite regularly. I finally sent an email to LinkedIn today with a link to Mike’s obituary from over two years ago. I am hoping they will quickly act to verify the truth of my claim and suspend his account. Of course, this brings up a good question: how will online communities deal sensitively and wisely with the death of their members? It doesn’t take a lot of thinking to realize that this sort of thing could be misused by those into identify theft and other less-than-positive pursuits. Anyway, rest in peace, Mike. I am wishing you the best in the afterlife. And as for LinkedIn, I am hoping they will act soon to fix-up this rather macabre mix up. I’ll update this post to let you know how what happens to my LinkedIn help ticket.